Last week was a little rough, I got hit out of the blue with a nasty virus and was down for the count for the entire week and into the weekend. Fortunately in between naps and dog snuggles I was plugging away on my latest finished object, the one I’m calling Mint Madness. This started as a sketch and a way to mix up some yarns I already had. 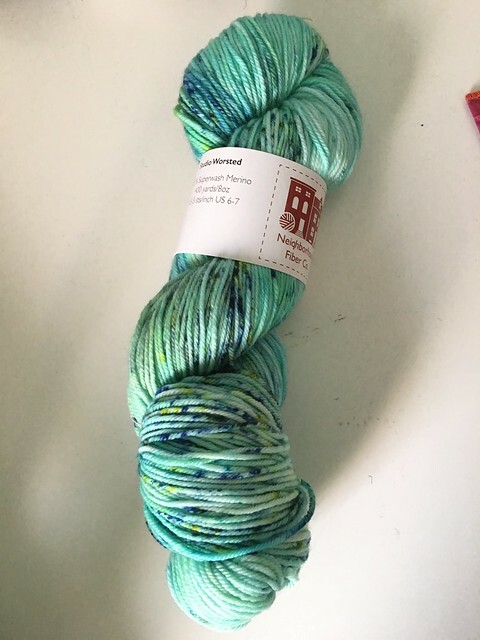 You may remember when I went to Neighborhood Fiber Co for a dye workshop and I made this very pretty mint yarn…well I still hadn’t made anything with it. When I popped over to Fibre Space a few weeks ago I saw this limited edition colorway from Neighborhood Fibre Co. called Swoon. My brain said this is the bridge color I needed because I also had a gorgeous stash of their vibrant cobalt shade, Georgetown. Mint, flecks of cobalt and a little bit of bright yellow and I was good to go! After my last saddle shoulder sweater I wanted to make another one just to work on my technique. This one isn’t perfect but I still love the end results. I’ve got to work on picking up my armhole stitches a bit better but hey, that’s why you keep on practicing. 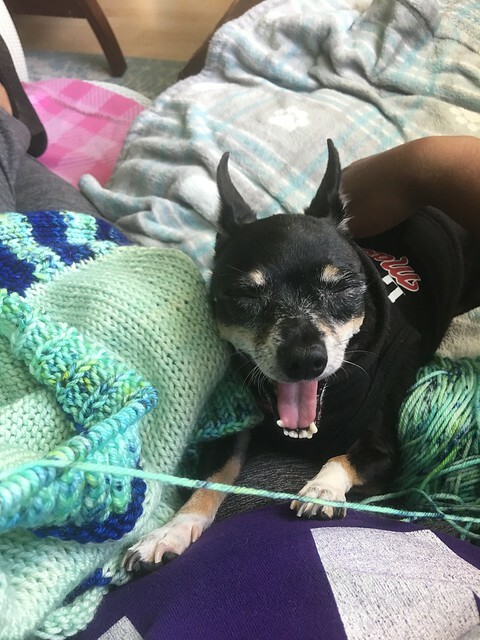 And with Cher asleep on one side and Jellybean constantly tangled up in my work, I’d knit in between naps and doses of medicine. And in the end, I got a cozy open cardigan for fall, that I’ve already worn to walk the dogs in the morning. I decided that I wanted to do a lot of ribbing on the sleeves so I can pull back the cuffs and had a three quarter sweater if I wanted or pull them all the way down to have a cozy cuff that goes a little over the wrist. 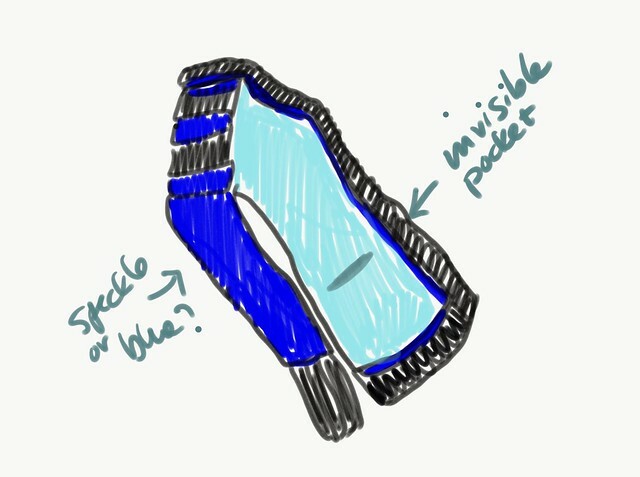 And I added bright blue pockets for a pop of color and because every sweater is made better with pockets. To make the pockets I held stitches back at my desired point and then cast on the same number to keep knitting across. Once I got to my desired body length I knit the pockets and then knit those stitches to the body and then seamed the sides once I was finished. I also went back and forth on whether or not there would be buttons but I just didn’t think buttons would work with everything else I had going on. So I skipped them and I’m glad I did. This is really one of those pieces I want to throw on whether it’s over jeans and a t-shirt or a dress. 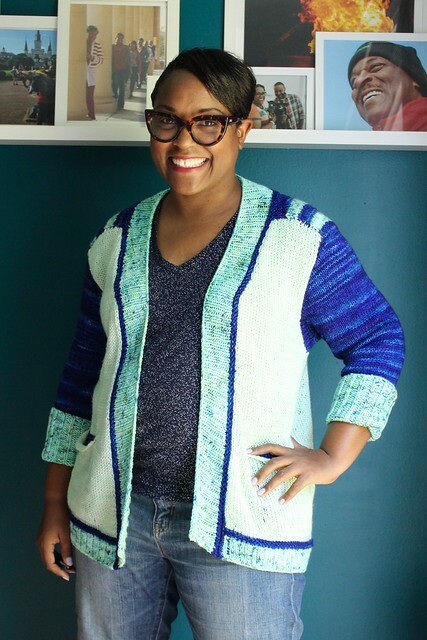 So now I’m almost over my cold and I’ve got a cozy sweater perfect for cool fall mornings. I’m pretty happy. I love it! You inspire me, Dana. 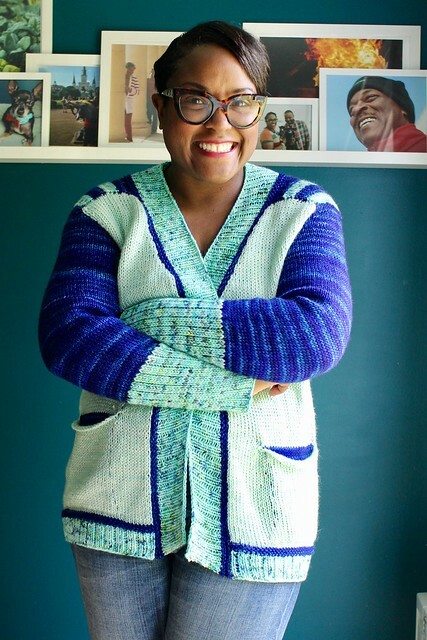 You are definitely a courageous knitter in my book. I also love your positive outlook about practicing. I am so glad that I follow your knitting journey. Thanks for your posts. Awww you’re making me blush. And if I don’t practice and try new stuff, I’ll never get good at it. I’m working on learning two color brioche and man it isn’t easy but I know that I want to conquer it! Glad to hear you are recovering!!! And what a gorgeous knit! Love all the colorblocking! I’m glad I’m recovering too, it knocked me out there for a second. And thank you! I love lots and lots of color. Your idea with the cuffs is great since I’m a fan of 3/4 length sleeves as well as long sleeves, and I love the pop of colour from the pockets. Nicely done! Hope you’re fully recovered now. Sorry to hear you’ve been unwell. 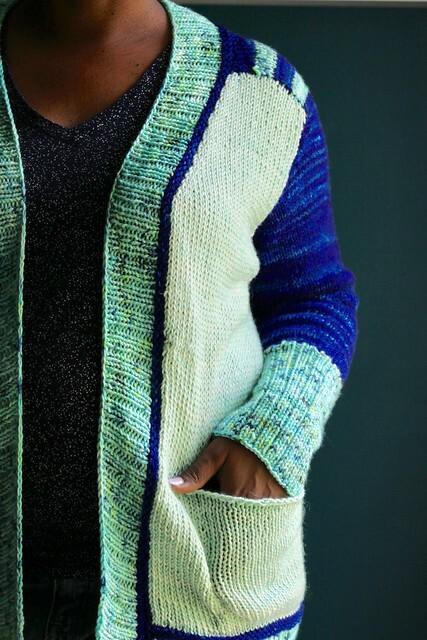 Love the mint yarn! Thank you! That was the color I dyed myself. I love mint, it feels fresh. Well done you. It’s gorgeous! Well, I just love this so much I don’t even know what to say. It’s perfect. I love this! I need more mint in my life along with teal and forest greens.